Every so often we notice an interesting infographic using LinkedIn Corp.LNKD +1.04% data. What universities, for example, are the primary feeders for tech employers like Apple Inc. (turns out it’s San Jose State) and Microsoft Corp.MSFT +0.66% (University of Washington by a landslide)? What company internships lead to good jobs in different industries? (most are predictable, but surprises include Plante Moran in accounting, Protiviti in management consulting, and Persistent Systems 533179.BY +1.37% in computer software) And for the inevitable holiday PR offering, what do professional Santa Clauses do when it’s not the holidays? (marketing event manager is the most likely role). These may seem like amusing ways to spend your time when you are tired of watching cat videos, but they are actually indicative of some serious business value. The infographics are summaries of what companies can do with data products. One of us (Tom) has written columns about data products on this site, and the other (Russ) has recently written a book on the topic called From Big Data to Big Profits. Incidentally, making data products has been enormously profitable for LinkedIn. It credits data products with $450M in additional revenue for 2013, and that doesn’t count very successful “internal” data products like People You May Know, to which the company credits half its memberships. We think that LinkedIn is an excellent example of how to make money from data products. Its offerings are an essentially free service to most of its members, of course, but it generates revenue from data products and premium services. 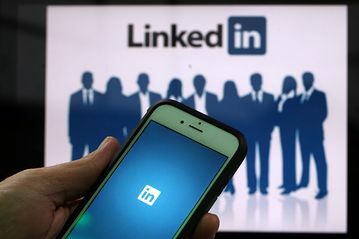 The data generated through the normal use of the network is an incredibly rich source of insight, and advertisers, search firms, and premium users are willing to pay for LinkedIn’s valuable data products. For example, if we choose to get a premium account, we can find out exactly who has seen our profiles. If we were professional headhunters, we could pay to get even more specific information, such as all the robotics engineers who graduated from Northwestern University in 2004. And if we were writers or editors (the infographic on tech feeder schools was published by Wired magazine) or university administrators, we could look for connections between specific schools or degrees and actual careers, to the point of calculating the potential ROI for any given degree. Despite this success, we think that LinkedIn could go even further to make its amazing data more valuable. It has a data products group within the company, but at least when Tom visited a few years ago, it had a pretty unstructured process for data product creation. Some of the company’s most successful data products came from outside the group. That’s not terribly surprising, because with 364 million members across 200 countries, the company has way more data than a small data products group (and an additional data science group) can deal with. In fact, it’s a bigger resource than all of LinkedIn’s 7600 employees can take advantage of. So we’d argue that LinkedIn should create an institute—perhaps called the LinkedInstitute—of external people who can help to analyze all this data and extract value from it. We’re sure that some of the knowledge generated could be monetized in some fashion, and perhaps even more importantly, the world would learn a lot. How useful would it be to know, for example, what educational preparation is most likely to lead to rapid promotion? What jobs are great stepping stones for a fantastic career? What places should you live if you want to be successful in different industries? What training is most useful and who needs it most (rationalizing in part LinkedIn’s acquisition of Lynda)? With personalized data, LinkedIn could even recommend the next best career move for individuals. These could all be extremely useful and valuable types of information. Russ found in his research on data products that some of the most successful providers of them share a lot of data. Uber Technologies Inc. and Airbnb Inc., for example, are successful in large part because they share a lot of data—normally for free—with their drivers and service providers. They’ve developed digital platforms just for that purpose. Both companies are worth an amazing amount of money for privately-held firms, and we’d argue that their information sharing is a key component of their value. Sharing to create the network of users, as in the case of LinkedIn, Uber and Airbnb, has led to more valuable data products that are ultimately sold back to those same users, while also attracting new participants in the network. So it makes sense to look to LinkedIn as a model for data products, but we think that even that company—and other successful examples of this phenomenon—have only scratched the surface of what is to be done. There is a massive amount of value in the data that online (and offline, for that matter) firms have accumulated. Unlocking it and creating new offerings based on it can become a key growth area for individual firms and our entire economy. Russell Walker, Ph.D. is a Clinical Associate Professor at the Kellogg School of Management of Northwestern University.